Our second day in Cape Town began with a visit to ExxonMobil’s exploration office. This group of approximately three ex-pats and five South Africans are charged with the task of discovering whether an area off the east coast of South Africa near Durbin is a viable site for drilling for oil. 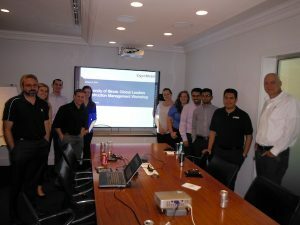 Four ExxonMobil employees, Peter, Dan, Miranda, and Jennifer, were kind enough to take time out of their day to talk with us about ExxonMobil and their operations in South Africa. The exploration for oil is a critical first step for ExxonMobil, which if it provides promising results, leads to a large expenditure for the developments necessary to retrieve the oil followed by the production period which can be thirty or more years. The exploration itself is a costly endeavor that only results in successfully finding oil about 20% of the time. ExxonMobil opened an office in Cape Town in 2013 after purchasing rights to explore off the African coast. They plan on exploring the area for oil and gas between 2016 to 2018. The plan is to use sound that is emitted from a vessel which is then reflected off the rock layers to listening devices floating on top of the ocean in order to determine the seismic data for the region. Multiple passes of the area are made by the ship in order to create a comprehensive 2D or 3D model. Since there are many species in the ocean that rely on sound, ExxonMobil takes special precautions to ensure no marine life is impacted by the exploration. Using this data, the people in Cape Town will be able to determine whether or not this site has hydrocarbons or not. Of course, there is never 100% certainty based on the data that there is oil, not until drilling begins can the presence of oil be confirmed. Other important work ExxonMobil is doing in South Africa involves their involvement in the community. They have sponsored several programs and initiatives such as Adopt-a-School, Africare, Thanda, STEM programs, and Global Women in Management Program. ExxonMobil has tried to engage the community to understand and assess what is truly important rather than just writing a check and walking away. Through their assessments, they were able to understand the social problems affecting the community such as some children not being able to afford shoes or breakfast. Along with the social problems, they were able to help with the educational problems by providing desks and a library to the school. We capped off our visit with ExxonMobil with some South African braai (barbecue) lunch which was generously provided by ExxonMobil. We were able to enjoy the meal and additional conversation with our hosts. Overall it was a great visit in which everyone was able to learn a lot about ExxonMobil and their involvement in South Africa. 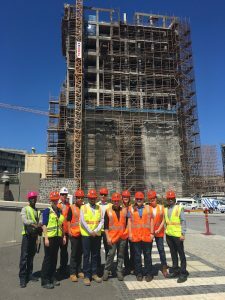 Our next stop was to Cape Town’s waterfront where we visited a new hotel/museum that is being constructed by WBHO. The new structure is actually not that new at all. It is an old grain silo, that was originally constructed in the 1920s and was the tallest building at that time, being renovated. The building is also a heritage site, which was the main reason why the owner decided to renovate the existing structure. 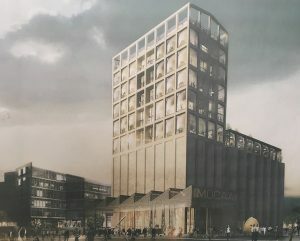 The building will showcase the previous use as a grain silo by leaving almost all the concrete exposed, some being rough other parts finished. 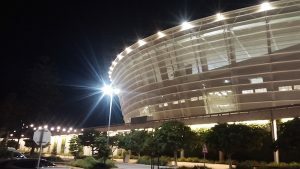 The total cost of the project is around 500 million Rand with an expected duration of 36 months. There are currently around 750 craft on site working at a very fast speed in order to complete the project on time. As can be seen from the large number of craft on site, this project is very labor intensive. This is due to the fact that the South African labor force is large but mostly unskilled. Since labor is relatively cheap, they are able to somewhat make up for the unskilled part by throwing a lot of people at the project. However, the project was very interesting and complicated since an old building was being renovated. The existing silos were made of concrete with no reinforcement and were not able to structurally bear the weight of the the new building. 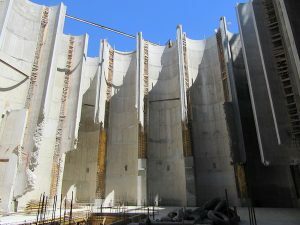 As a result, they had to re-sheath inside the silos with new concrete and reinforcement. Overall it was a fascinating project to see up close and provided some great discussion. 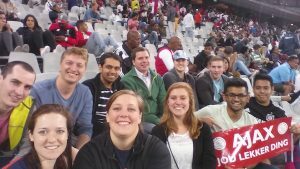 Last, but not least, we were able to attend a local soccer game that was held in the Cape Town Soccer Stadium that we had visited yesterday. The game was between the Ajax Cape Town and Bloem Celtic which ended in a 2-2 tie. Everyone had a great time watching the game and it was a terrific way to end the night.